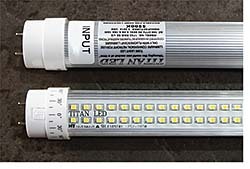 The 4-foot tube delivers 1,850 lumens from 17 W. The design features 290 SMD LEDs, extruded D-shaped aluminum, and rotating end caps. It replaces 40 W fluorescent tubes with 55 percent energy savings. The UL-listed tube also accommodates universal voltage up to 277 volts (V) and includes a five-year warranty. Made in the USA.